James E. Stargel, 78, of Nashua, MN, passed away under the compassionate care of hospice on Wednesday, November 21, 2018. Visitation will be held from 5 p.m. to 8 p.m. on Wednesday, November 28, 2018, with a prayer service at 7 p.m. at Joseph Vertin and Sons Funeral Home, Breckenridge, MN. The funeral service will be held at 11 a.m., Thursday, November 29, 2018, at St. Paul’s Lutheran Church in Campbell, MN. Burial will be held at a later time at Riverside Cemetery, Nashua. James, affectionately known as “Jim,” was born on September 7, 1940, the son of Earl and Pearl (Maudal) Stargel. In 1958, he graduated from Elbow Lake High School and a few years later, Jim met his future wife, Gloria Rude at the Fergus Falls roller-skating rink. They were married, in the midst of a spring snowstorm on April 15, 1961, in rural Dalton, MN. Jim and Gloria made their home in Nashua, MN, and were blessed with two daughters. Jim spent most of his career working on a large farming operation and after retiring from the farm, he continued to pursue his passion for his fur business, NorthStar Furs. He took pride in his talent and taught children about his trade and the skill involved in his craftsmanship. 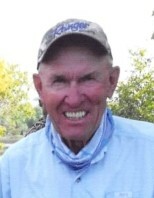 Jim loved nature; he was an avid outdoorsman. He packed as much as he could into each outdoor venture and took every chance he could to bass fish, or really, fishing of any kind. Jim knew that life was meant to be filled with family, friends, laughter, kindness, and adventures. Jim enjoyed taking short trips within the state of Minnesota with his wife. Most important to him was his faith, he witnessed his faith to everyone and made strong connections with those around him. Jim was a simple man who released every fish he caught, and his family and friends are sure he has caught his limit of heavenly bass. Jim is survived by his loving wife, Gloria; daughters, Shelley (Gary) Eichhorn of Breckenridge, MN, and Annette (Dan) Schaffer of Fargo, ND; grandchildren, Tyler, Cody, Jesse, Sarah, and Kelsey; 8 great-grandchildren; sister, Marilyn (Vern) Aarness of LaPine, OR; and several nieces and nephews. He was preceded in death by his parents, Earl and Pearl Stargel; brother, Gary; and niece, Chauntal Aarness. Arrangements have been entrusted to Joseph Vertin and Sons Funeral Home, Breckenridge. There's still time to send flowers to the Visitation at the Joseph Vertin & Sons Funeral Home from 5:00 PM to 8:00 PM on November 28, 2018.